James Calderon has been playing violin for eighteen years. Early in his studies, he became enthusiastic in fiddle and improvisation, which eventually led him to obtain a Bachelor's Degree in Violin Performance and Composition at Eastern Illinois University in Charleston, Illinois. With his diverse background in classical, jazz, folk, and rock violin, James has spent six years performing for weddings, dinners, parties, and live music shows. He currently performs with the Frederick Symphony Orchestra and the Washington Metropolitan Gamer Symphony Orchestra. He has also performed in various orchestras in Illinois and Indiana, including the Danville Symphony Orchestra, the Kankakee Valley Symphony Orchestra, and the Lafayette Symphony Orchestra. As a teacher, James prefers to customize his curriculum to each individual student, and encourages learning styles of violin playing that exist outside of the concert hall. 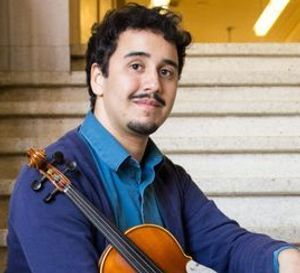 Not only do his students learn the fundamental techniques and repertoire of the instrument, but they also learn about music theory, improvisation, and professional violinists who deviate from the norm in their own ways. Learn more about James at his website here! Click here to contact us about lessons with James!